HSR layout is now coming into the focus for putting together a good reliable cycle infra..and in the light of this there was a plan that DULT had earlier started with for their DPR. Below is the map of that. 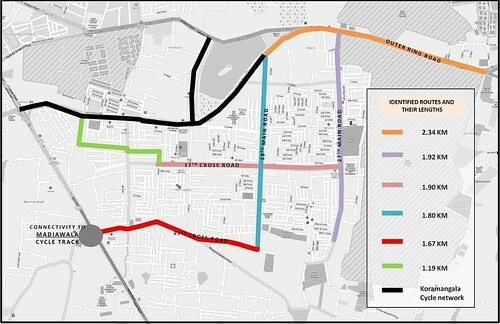 The plan with DULT was to connect the madivala cycle track with the HSR one. On the outset this plan looks like a conservative one to the likes of the Jayanagar one which has much more routes. We will eventually look into the DPR, however thought it would be good to assess the planned route to check if it really addresses the needs of bicycle users in HSR. Request to please review the map and check if its adequate! Submitted by rackstar on 15 November 2012 - 1:26pm. Instead of marking exclusive lanes for bicycles, exclusive parking for bicycles can be marked at various points. This is easier to enforce as motorcycles and cars cant park in bicycle parking place. Bicycle parking places can be at various commercial places and situated every 1km or so. There will be no parking board and cycle only parking board both including border markings on road. Submitted by srinidhi on 15 November 2012 - 2:47pm. If you see the current Jayanagar cycle infra, there are 'no-parking' signboards and all..but all of it is blatantly violated and ppl park cars on them..and enforcement is a different ball game! Your thought of having marked cycle parking lots every KM is good..however I believe tracks are meant to provide unhindered right of way..so guess the cycle parking slots will need to be close to the tracks and not on them itself! Submitted by rackstar on 16 November 2012 - 9:54am. Enforcing handful parking places is much easier than enforcing all new concept of cycle tracks. That too tracks are so long so enforcing is difficult, with no parking boards every 100m distance, instead exlusive free parking near commercial establishments should serve the purpose equally well. And in exlusive parking lot one need not park his bicycle next to motorcycles, so cycle theft chances also reduced due to high visibility. Submitted by srinidhi on 17 November 2012 - 8:19am. So, ideally there is no enforcement needed since the tracks are separated..the above contra lane(2-way) track is what I was suggesting for HSR...on one side of the road..ofcourse we may not have the luxury of the tree shoulder/beuffer lane..but its still do-able! 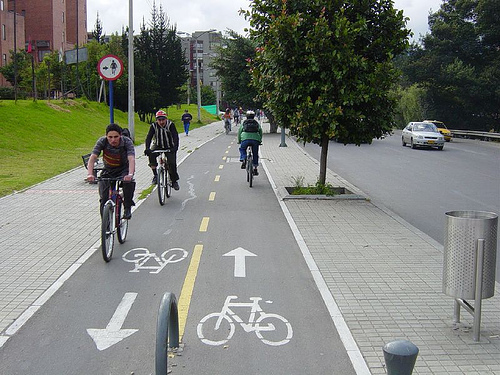 Btw the above pic is from Bogota..I suppose transportation problems are quite well sorted out there! cycles for economic and social freedom?! Mobilicity Meeting updates..quite successful on NMT front!